Folk is comforting. The time honored tradition of listening to a man in a thick sweater serenade the fireside with nothing but his voice an an acoustic guitar has brought solace to listeners over the world. Sometimes it’s slow and methodical, other times energetic, often times it steps the line between music and poetry. Yet, folk music has always backed away from unsettling its listeners, the lyrics may occasionally be bleak or disturbing, but the backing of the music itself rarely tips into the realm of fear inducing. Enter Greg Jamie, the man who has chosen to break the mold with some of the most terrifying and compelling compositions to take place in any genre, much less folk. 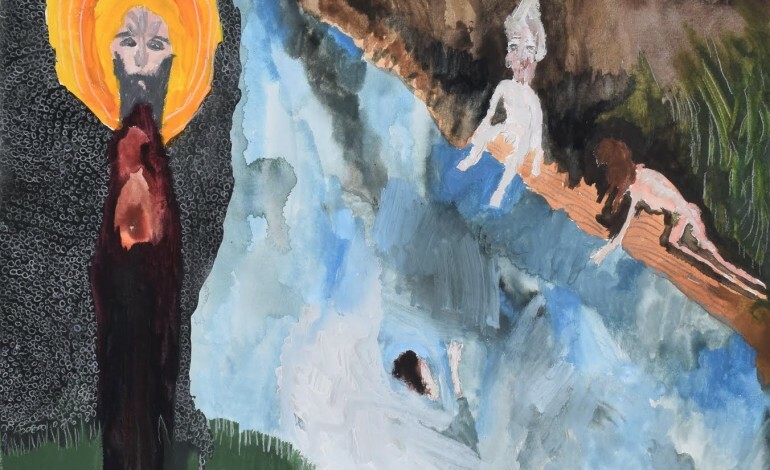 The opening track “Inherit the Wind” is strangely reminiscent of Fleet Foxes, though much more visceral and rough than anything Robin Pecknold has ever produced. The guitar clatters maddeningly while violin strings are seemingly ripped from their frets during the more energetic moments of the song. The whole record could be described as “oppressively dour;” the middle tracks, particularly “Everything Here” which is downright unsettling. Jamie sings in a ghastly wail over rapidly deteriorating stringed instruments. The whole experience adds up to one of the most haunting and deeply terrifying musical experiences in ages. Themes of terror briefly subside during “Time Went Crazy,” at least from a compositional standpoint. Lyrically there is discussion of “shedding skin” and “taking bodies to the shore” so it’s good to know that the theme still remains largely intact. Instrumentally it is much more plodding than the previous tracks, but a careful ear will notice a frenzied rush of strings swelling in the background. It draws an interesting comparison to noise music, particularly the creations of Prurient; by creating a repetitive and comforting structure, the music is allowed to trick the listener into not noticing the warning signs of a musical collapse. By the time most people latch onto the string rush, the song has already plunged into an eerie valley of reverberating isolation, where it remains until its final moments. Many listeners may ignore this, simply accepting where the song goes, but by not filling in the listener on how the song gets there, or even why, Jamie pulls off the musical equivalent of meta horror in music. Suddenly up is down and left is diagonal, the structure is fundamentally broken from the expected norm, creating an absurdly engaging moment in songwriting that even the most expert of composers would have difficulty crafting. Albums like this don’t come along often, though most dedicated music lovers would hope that more are created. Regardless of personal taste Crazy Time is a mind bogglingly unique piece of music. It pulls off tricks that movies, books, and video games have difficulty executing, all with a single sense. Saying albums like this rarely come along is an understatement, art like this rarely comes along. The very prospect of missing this record is offensive. So turn down the lights and strike up the fire, keep a shotgun close by, there might be something in the shadows.